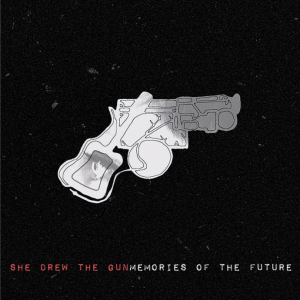 Starting as a platform for Louisa Roach's solo music, She Drew The Gun became something more, with her forming a band and recording an EP, which soon turned into their debut album Memories of the Future. Having been raved about on BBC Introducing, Roach soon set out on tour with Fink around the end of 2015, showing off the band's style around the UK and Europe. The slow and rustic atmosphere of opener 'Where I End and You Begin' sets the tone for the entire album, with Roach's softly spoken vocals being highlighted throughout every song. 'Chains' is a bit more pop-y but still fits the mood and serenity of the album perfectly. Single 'Poem' is very reminiscent of Kate Nash, with more talking than singing the lyrics, which is something not particularly common currently and certainly makes the album very unique and shows that She Drew The Gun aren't just about slow music and guitars. This album is a well-polished debut, especially since their quick beginnings and pace that they've accumulated in the industry so far. If you want to buy Memories of The Future, you can do so on iTunes, Amazon (UK | US) or listen to it for free on Spotify. Also follow She Drew The Gun on Twitter, Facebook and Instagram to see what they're up to. Don't forget to follow me on Instagram and if you want to see my latest posts first, then sign up to my email list - there's a box on the sidebar of this blog where you can pop in your email and a new post of mine will come straight to your inbox.